National Women’s Sledge Hockey Captain, Peggy Assinck, and ten year National Wheelchair Rugby veteran, Trevor Hirschfield, recently shared their stories and broke down barriers regarding disabled sports in Canada. Changing Minds, Changing Lives is a program that educates healthcare professionals, students, and community groups on the benefits of sports and how to get their clients involved. In Canada, less than 3% of the disabled population participates in sports, compared to that of the overall population, where 30% of individuals take part in organized team activities. It’s easy to see the misconceptions of living with disability and being able to play competitive sports, but living with a disability and competing on an international level, is almost unfathomable. Peggy Assinck was born with Spina bifida, a birth defect that affects the formation of the spinal cord during development. This left her with compromised function below the level of her affected spinal cord. While her classmates were being physically educated in the gym, Peggy grew up sitting off to the side staying busy with artwork and school projects. At 12 years of age, teachers realized that it was important for Peggy to get involved in physical activities. The small Northern Ontario town of Apsley had only one disabled sport available; Sledge Hockey. Luckily, Peggy fell in love with the sport and has been playing for almost 20 years since. The hardest thing when getting introduced to sports is actually getting to the venue. The mental and emotional hurdles far outweigh the strength and physical barriers surrounding organized sports. Peggy recommends going with a friend for a first time sporting experience, since it’s intimidating to try something new with no prior experience, never mind trying something new with physically fit athletes. The key is to have an inclusive environment while getting started, where the best athletes must facilitate fair play and show the new players a fun time, otherwise the new players will not return. Peggy now runs two Sledge Hockey programs in Vancouver and Surrey. She also trains with the BC Eagles Sledge Hockey team in Surrey. Trevor Hirschfield was born able-bodied, but at the age of 16, a traffic accident where his van went over a cliff, left him paralyzed below the neck. Duncan Campbell, the inventor of Wheelchair Rugby, otherwise known as Murderball, tried to recruit Trevor to play while in rehabilitation at G.F. Strong. But Trevor had no interest in playing sports while in rehab; his focus at that time was on getting his life back together after such a tremendous loss. A year after being discharged back home to Parksville, Duncan called Trevor and said it’s time for him to start playing Rugby. BC Wheelchair Sports put on a Bridging the Gap program on the Island specifically for Trevor to get involved in Wheelchair Rugby. Trevor then made the decision to make a trip twice a week to the mainland to practice with the BC team, since there was no rugby team on Vancouver Island at the time. Trevor says it’s not playing sports that make it fun, but it’s the friends and connections you make along the way that make sports worthwhile. It’s not playing on the field that you remember, but it’s the good times in the locker room and travelling to tournaments with good people that sticks with you the most. Trevor was named an All Star at the 2010 World Wheelchair Rugby Championships and was also awarded the 2010 Canadian Wheelchair Sports Association Male Athlete of the Year award. Trevor now resides in Vancouver with his Fiancé and trains with the BC Wheelchair Rugby team at the Richmond Olympic Oval. Being physically disabled makes it difficult to get involved in physical activity for obvious reasons. But, being physically fit with a disability makes it easier to do daily tasks such as dressing, bathing, and transferring . Interestingly enough, it’s the confidence, the motivation, and the courage that are often overlooked attributes which spawn from sport. We now know that when engaging in a physical activity, your body releases endorphins, which interact with the receptors in the brain to reduce pain and give a euphoric effect known as the “runners high”. 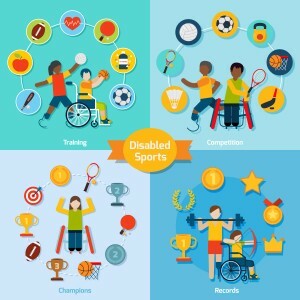 Current research has shown that playing sports is beneficial especially for a person with a disability; since sport has rehabilitative influence in getting people from different backgrounds to play together in a positive way. This facilitates community integration, personal development, and overall well-being.